I’m as guilty as the next person of eating my favorite foods over and over. Hardly a week goes by that sweet potatoes don’t pass my lips. Nearly every day I eat a banana. Even though I do eat my favorite foods a lot, I also am cognizant of eating a wide variety of foods and helping my family do the same. Nature is so fantastic that it’s easy for us to visualize if we’re getting a good variety. Just look at the different colors of your food. Monochromatic is not the look we’re going for. Think lots of colors. Think about the rainbow. Variety is important because different foods have different vitamins and minerals that help our body function properly. If you consistently skip out on a certain color of food, you’re likely missing some key nutrients in your diet. Take a look at this infographic that illustrates beautifully what nutrients we find in different colored foods and what they do for our bodies. It’s one thing to know we should be eating a big variety of food (especially plant-based foods). Knowing is easy. 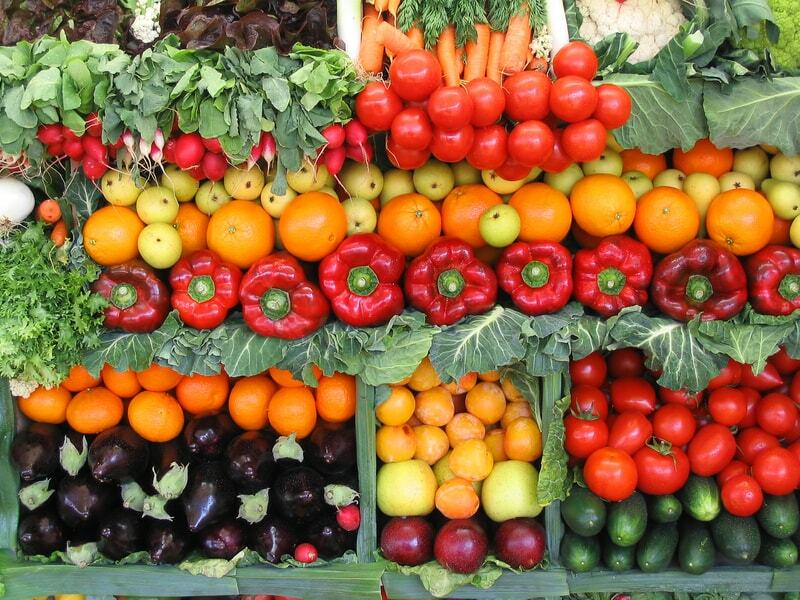 It’s much more difficult to actually make sure we’re eating a wide variety of colors every day and week. So how can we plan to eat a bigger variety of foods? The key word is PLAN. When you are deciding what to eat, think about the different colors of foods you are planning to eat. How many different colors will you include in your meals? I’ve put together a handy printable to help you with this planning. 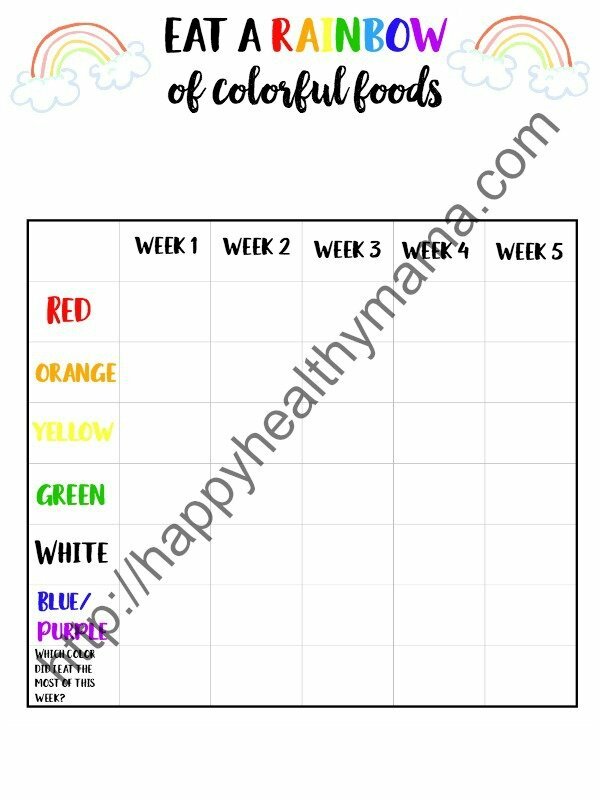 When you are planning, you can use this chart to help you make sure you’re getting all the colors each and every week. Click here to enter your email address and download the free printable with no watermark. I focus on weeks instead of days because I think it’s more important that we get a wide variety over the span of a week than individual days. You can use this printable in a few ways. Like I mentioned, it can be used when planning your meals. You can use tally marks as you plan different colored foods into your meals and it can help you make sure you’re planning to eat a wide variety. This is also a great tool for keeping track of the different colored foods you’re eating. At the end of each week, you can count up which colored foods you’ve eaten the most of and look for patterns over the course of the month. If you’re consistently eating one color as your main color, you may want to work on more variety. It can help you focus on the colors that you’re consistently eating the least of, also, and work to eat more of those. Of course, this is an outstanding tool for helping kids to learn about the importance of variety, too. Kids can use small stickers, stamps, check marks, or tally marks to keep track of the different colors of foods they are eating. It could be a fun contest among siblings or family members to see who can get every color every week. If you’d like to use this free printable, Click here to enter your email address and download the free printable with no watermark. You’ll also be added to my email list so we can keep in touch and I’ll send you a weekly newsletter that’s filled with healthy living inspiration. Win win! You can use this printable to plan for eating a bigger variety of foods. But, let’s just say you aren’t a big planner. Planning isn’t your thing. 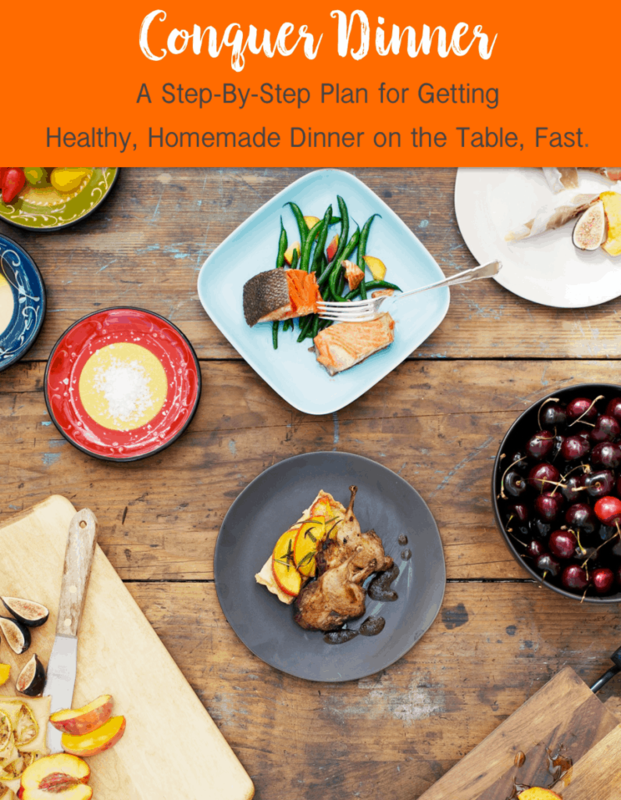 I’ve got something else that can help you with at least one of your daily meals: dinner! My e-Book, Conquer Dinner, is coming out NEXT WEEK!!(Eeeeeeek! I’m so excited I can’t help but use the cap lock key and multiple exclamation points!!!) Not only will this e-Book help you make healthy, homemade dinners a reality for you and your family, it also has variety built in. I did the planning for you. At least you’ll know you’re getting a good variety of colorful plant foods in your days and weeks if you use my e-Book for your dinners! Exciting right? Eating a wide variety of colorful foods is so important to make sure we’re getting all the key nutrients we need. I hope you’ll be intentional in making sure that happens for you and your family. Your health is worth it! Fruits and vegetables are colourful gifts that nature offers as visual and tasty treats to children. This article aims to teach you some fun ways to make your child love fruits and vegetables.